Day two on Anguilla. A desert island in the northern most part of the leeward islands in the Caribbean. Paradise Island. One of the provisions that my hubby insisted upon in agreeing to accompany me to Anguilla was that he be able to rent a 4×4 for the duration of our stay. I didn’t understand why one would need a vehicle on an island that is only 16 miles long and 3 and half miles wide with only one stop light, but a deal was a deal. So off we went into the only real “town” on the island to rent the Jeep I had reserved in advance. As it turns out…there is a catch. 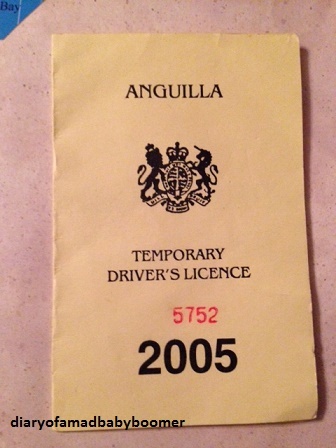 A driver’s license from California does not fly in Anguilla. Really? So someone who can negotiate the serpentine lanes of hell in Los Angeles is not qualified to drive on a remote little island where most folks travel by bicycle? So off we went to the little DMV (haha, that’s funny. It was a counter in a drug store I think) and took the “test” (show your valid license from anywhere) and paid the fee (pretty hefty at 20.00) and the hub was officially licensed to drive in Anguilla. A genius way to have users help pay for the maintenance. Ever tried driving on the opposite side of the road you are accustomed to when there is no other traffic to help keep you in line? Very hard to make a left turn into the left lane when you have spent your whole life executing that turn into a right lane. Needless to say when we would actually come upon another car, it was nerve wracking to be second guessing whether or not you were in the right place (at least once…we weren’t). I was trying really hard to not get mad about having to spend so much time on the second day of my very short vacation having to negotiate red tape and relearning how to drive backwards…er sideways. And by drive, you know I mean backseat drive, right? Luckily, I could distract myself with the directions on how to get to Little Bay Beach. Even though it had started to rain lightly but steadily, we were undaunted in seeking our destination. 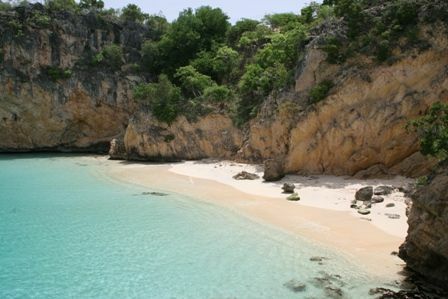 Even now 10 years later, I can’t help but smile when I think of Little Bay Beach, Anguilla. Why? 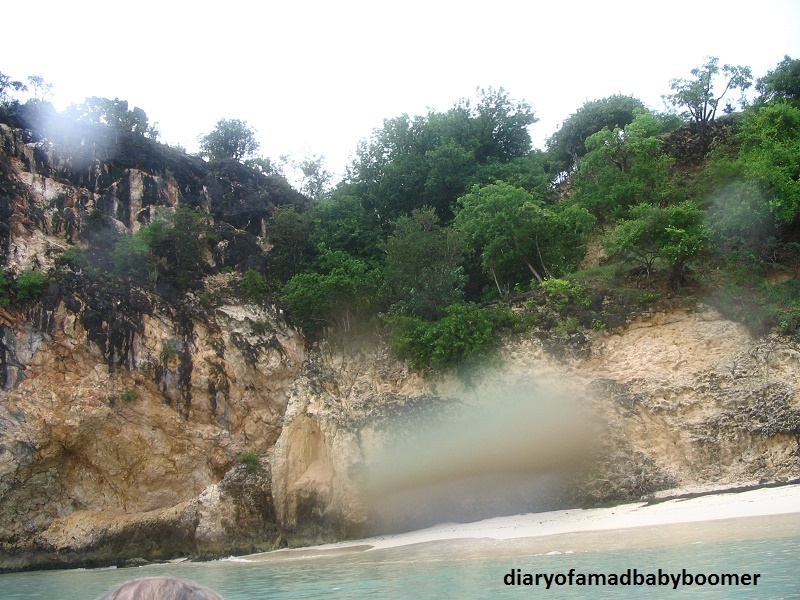 I had done my homework before going to Anguilla, so I knew Little Bay was a must on our itinerary. It is listed as remote and serene…does it get any better? 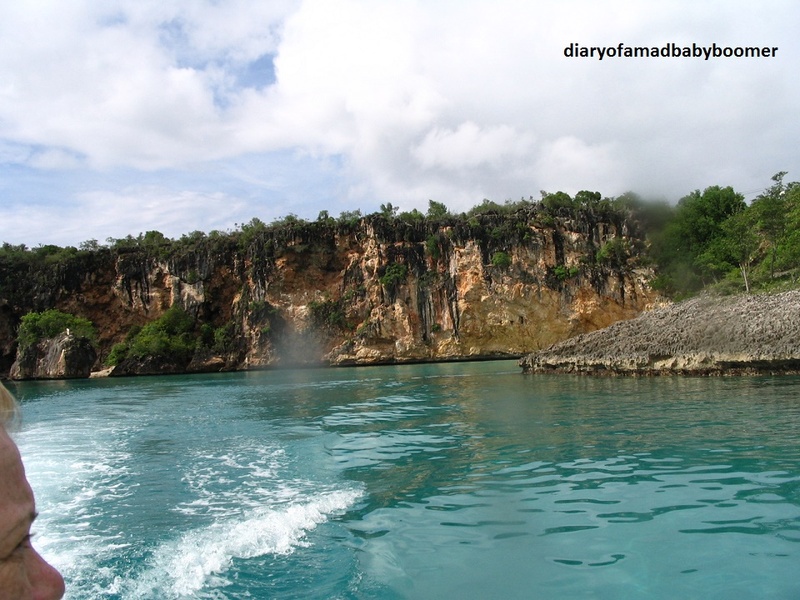 Little Bay is only accessible by boat or repelling down an ancient rope on a vertical cliff. When we had finally found the beach and looked down from the overgrown aforementioned vertical cliff, we had to rethink repelling. It was slick, and even if my hubby and I were willing to gamble with our adult lives by living so dangerously, neither of us were willing to take the risk with our daughter. Already the Jeep was paying for itself. It would have been a long walk in the rain if a taxi had dropped us off. So off we were to find boat transportation to Little Bay. We parked at Crocus Beach and began asking around at the locals hanging around playing dominoes. Not those actually playing dominoes because by interrupting a domino game in Anguilla you would be putting your life in mortal danger (probably not literally, but I wasn’t going to gamble there either), but those standing on the periphery. We were informed to ask for Calvin who would be sitting under a tree. Indeed he was. We enlisted his charter (a little dinghy) and I instantly fell in love with him. He brought a large umbrella for us (from a local café I think), and used his well worn party hat to shield himself. Does it get any more adorable? Somehow, I don’t think the hat was doing much good but you wouldn’t know it. Within just a few moments our destination was in site. It didn’t disappoint. Then again, nothing in Anguilla does. As we neared the shore, the rappelling cliff came into sight. Probably a good idea to have Calvin boat us in. Please disregard the rain on the lens ok? Oh but even in the rain, the little beach (hence the name) was divine. I am including a photo I plucked off of the Anguillabeaches.com site since I didn’t get it in it’s entirety..
and within seconds I was completely engulfed by a huge bait ball which was remarkably fascinating and a little gross feeling (on my skin) all at the same time. 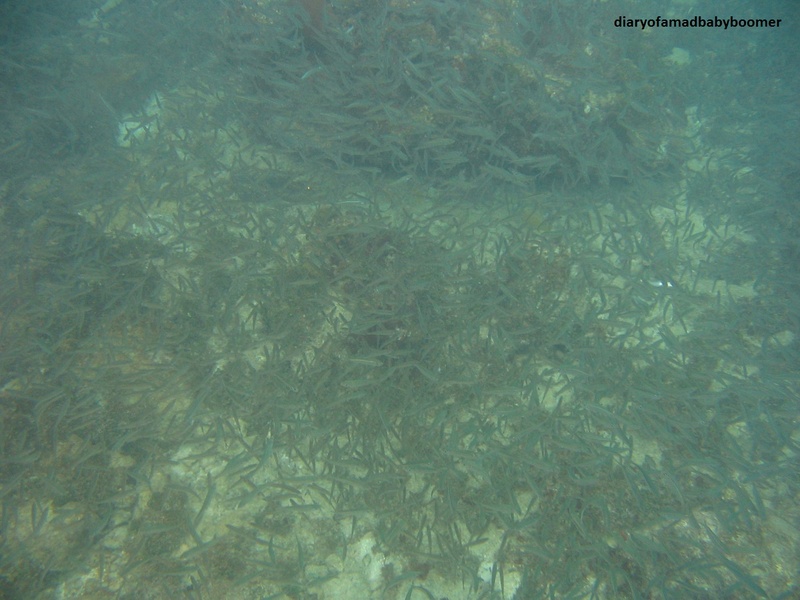 Even if I would have been thinking about what follows bait fish, I wouldn’t have been afraid. I have never been too afraid (although I have not come face to face with a Great White and I hope I never do) of underwater creatures. I am much more frightened by those who walk on two legs. Oh and bears. You know I’m terrified of bears. Still surrounded by the bait ball, I made my way to the surface to get air and right before I broke the surface I came nose to nose with a giant sea turtle. 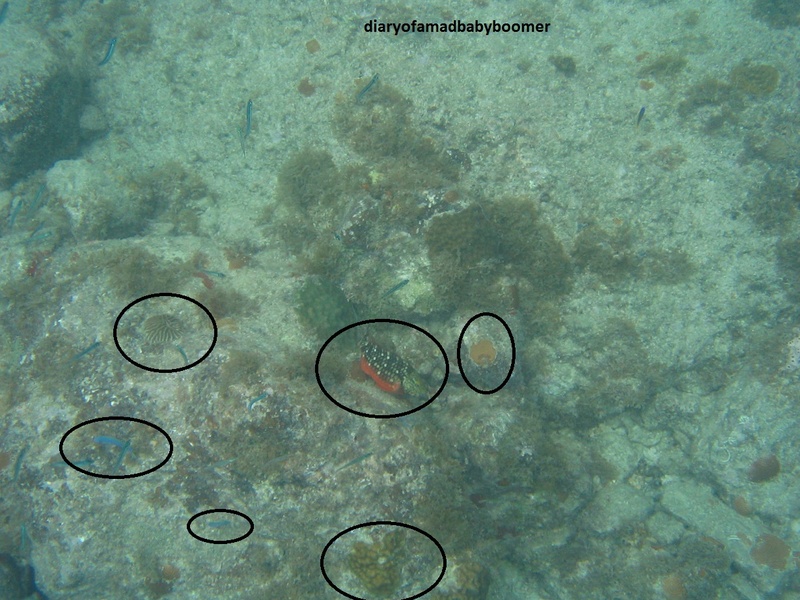 I still wonder if the startled scream I let out could be heard coming out of my snorkel above water. 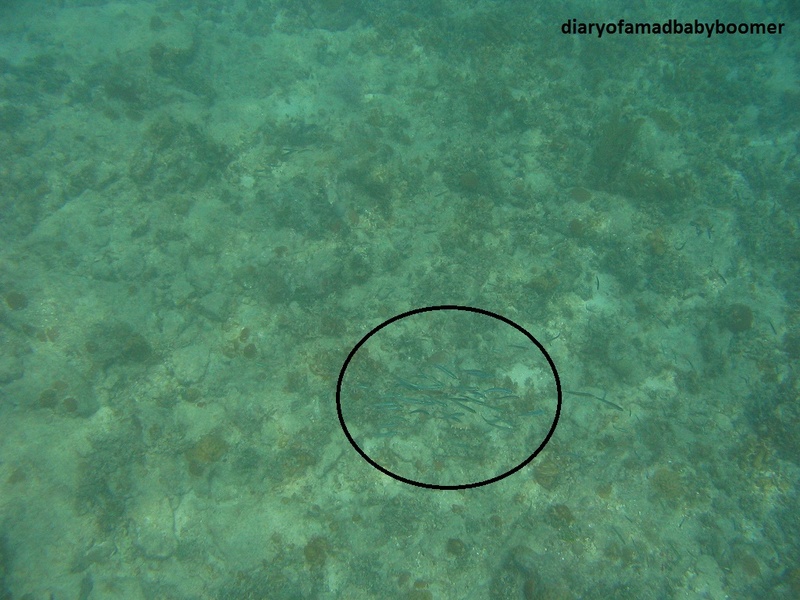 The poor sea turtle was just as startled as I, but did not scream. I wish I would have had the presence of mind to snap a photo. But I didn’t. When I filled my lungs with air and ducked back underwater, my friend was gone. And so apparently was the bait ball. Just that fast. 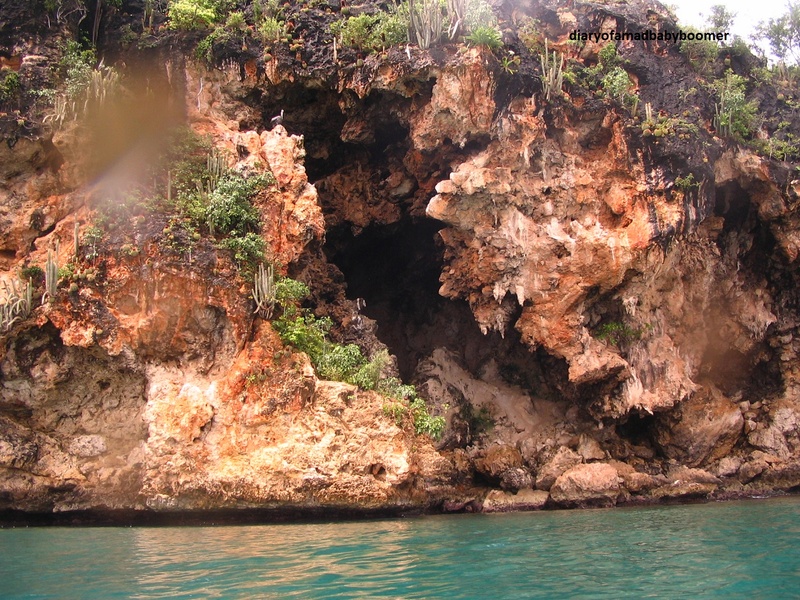 I did however have the presence of mind to snap a photo of what was above water, a most incredible cave. The perched Pelican can give you an idea of the scale. Unfortunately my free dive fins did not allow for easy exploration so I just marveled from the azure water. While scouring the bottom of the bay, I found an old wine glass (these use to be pirate waters) and as soon as I handed it to my daughter to look at, it was promptly dropped back into where it came, never to be found again. I suppose things are meant to be where they are. After spending what seemed like minutes but was actually hours, Calvin came to fetch us from our liquid bliss at exactly the agreed upon time. I could pretend that this Eden was my own playground (we didn’t see another soul all day), but I couldn’t pretend to stop time. Goodbye Little Bay. I still miss you. 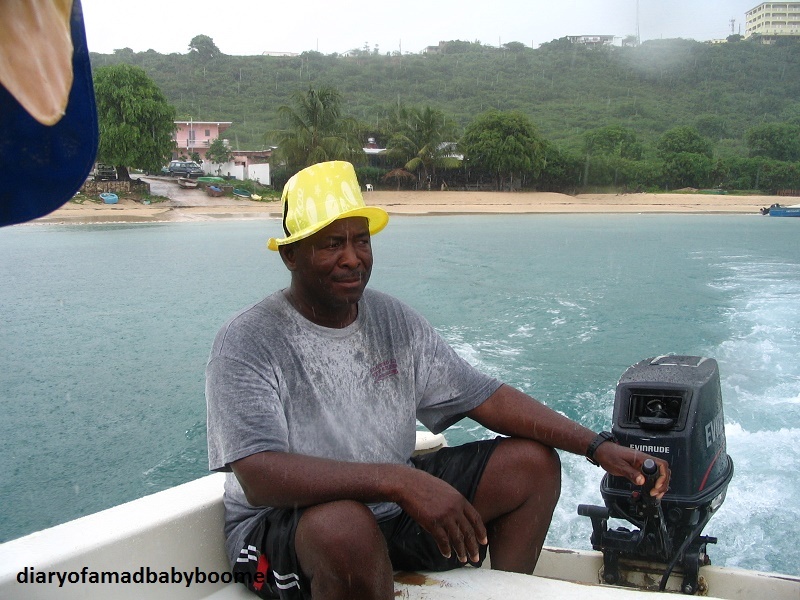 This entry was posted in Bucket List, Travel and tagged Angulla, Bait ball, Bucket List, Bucket List Adventures, Calvin Little Bay, Dear Diary, Little Bay Anguilla, Little Bay Beach Anguilla by ckdenson. Bookmark the permalink.